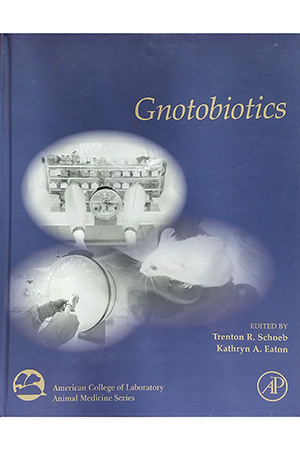 Gnotobiotics, edited by Trenton Schoeb and Kathryn Eaton, is invaluable to those developing or managing gnotobiotic facilities. The book is part of the American College of Laboratory Animal Medicine Series, published by Elselvier, and covers a number of species including rodents, swine and fish. It is assembled from contributions by nineteen authors with firsthand experience managing gnotobiotic facilities. James Fox nicely captures the essence of this book in his foreword: "[T]his text provides the biomedical research community an essential text on the successful operation of a gnotobiotic research facility and provides compelling examples of the use of gnotobiotic animals in understanding the complexities of how the microbiome plays an indispensable role in the shaping of host's physiological and immunological responses required to maintain homeostasis." Gnotobiotics opens with a brief history, summarizing efforts from 100 years ago to derive germ-free guinea pigs. Gnotobiotics and germ-free standards as we know them today have their early roots in the work of Gustafsson (University of Lund and Karolinska Institute) and Reyniers and Trexler (LOBUND Institute at the University of Notre Dame). Some of the techniques developed by those early pioneers are still in play today. Chapter Two, Principles of Establishing and Operating a Gnotobiotic Facility, provides the background knowledge required to establish a gnotobiotic facility. The chapter covers finance, space, and equipment requirements and provides details on isolator selection, sterilization, and some operational considerations. At 269 pages and well over half the book, Chapter Three covers procedures used in rodent gnotobiotic facilities. This is fitting, as most gnotobiotic work has historically taken place in rodents and much of the current microbiome research is being conducted in mice and rats. The procedures in this chapter derive from three well-established gnotobiotic cores: University of Texas Southwestern Medical Center, University of Alabama Gnotobiotics Core, and the Center for Comparative Medicine at the Baylor College of Medicine. Information is provided in sufficient detail to support anyone endeavoring to start a gnotobiotic facility. Over 400 photos are provided to help readers see the equipment and tools being described or how to assemble required components. Many of the procedures described are supported by twenty-five tables of detailed lists, formulations, and vendor names. For those who will be managing gnotobiotic cores at academic institutions, Chapter Four — Developing a Business Plan for Your Gnotobiotics Program — helps you establish a business model that assures you are covering costs while assuring needed capacity and capabilities. Chapters Five & Six describe working with gnotobiotic pigs and fish, respectively, illustrating the importance of non-rodent germ-free animals in gnotobiotic research. The last two chapters of the book describe the use of gnotobiotic mice in the study of metabolic syndrome and inflammatory bowel disease, providing examples of how gnotobiotics are changing research in these disease areas. If we expect our gnotobiotics research to improve health, cure disease, and further the understanding of microbiome interdependencies, it is important to ensure the basic tools used to perform this research are produced to the highest standards of quality. Gnotobiotics is a significant effort in support of these efforts.